Andrea Pininfarina, chairman and CEO of the historic chassis company which bears his family's name, was killed Thursday morning in a traffic accident on the outskirts of Turin. Police said the 51-year-old industrialist was killed when the motorcycle he was riding hit an automobile driven by a 71-year-old pensioner who failed to yield the right of way and turned in front of him. The pensioner said he did not see the motorcycle in the thick fog. The accident took place just after 8am and Pininfarina is believed to have been on his way to his company's headquarters which was not far from the site of the crash. Until recently Pininfarina had been deputy chairman of the powerful industrial employers' association Confindustria under Fiat and Ferrari Chairman Luca Cordero di Montezemolo. ''With Andrea Pininfarina I have lost a great friend and outstanding business partner. Together we shared years of work and successes with the Ferrari cars he designed,'' Montezemolo said on learning of his friend's death. ''He was a man of great humanity and in this moment of deep sorrow my heart goes out to his parents, his wife, children, brothers and all his collaborators at Pininfarina,'' the Fiat chief added. Emnma Marcegaglia, who took over as Confindustria chief from Montezemolo earlier this year and had been deputy chairman together with Pininfarina, said that ''he will always remain in my heart for being a unique person and a true friend. Andrea was a person we all admired because of his unquestionable professional abilities and deep humanity. he will be sorely missed,'' she added. Andrea Pininfarina was the second child of Life Senator Sergio Pininfarina, who developed the family company in the post-war years. He was married to Cristina Pollion and had three childen. After earning his degree at the Turin Polytechnic in 1981, Pininfarina went to work in the United States in the automotive sector. He entered the management of the company created by his grandfather in 1987 and the following year was made general manager. 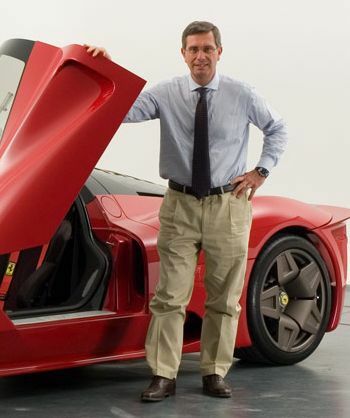 In 1991 he became CEO of Pininfarina Deutschland GmbH and in 1994 took over the reins of his family's company from his father.